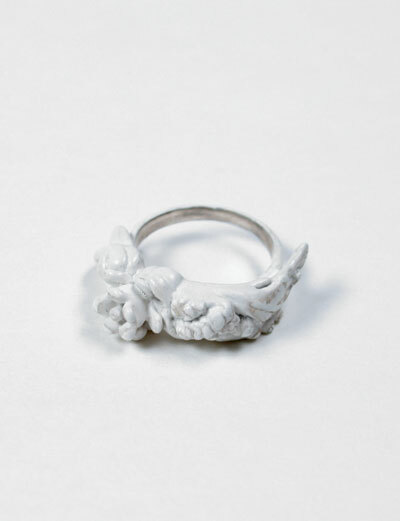 Earlier I was browsing Creatures of Comfort -- precisely the kind of activity that makes me feel very, very sorry for myself -- and I came upon this ring by Rue. I can be very picky about jewelry (I don't wear it often), and I love this little ring! The painted silver looks like delicate porcelain. If you don't mind a little cheek, I will just state that my birthday is 107 days away. Oooh...that is very pretty. I love browsing through their shoe section(not that I can afford any of them). That is a gorgeous ring. I've never seen anything like it. It's so pretty. I saw this jewlery in a shop someplace and the salesgirl was telling me how, over time, the paint chips off so that it looks old and worn in. Oh, wow. That's one of the prettiest rings I've ever seen.